Do you know how much it costs to acquire new customers versus retaining those that have already signed with you? According to a recent study it costs roughly six to seven times more to gain a new customer, than to keep an existing one. Email marketing is one of the many ways that we can communicate with customers on an ongoing basis. If you’re tired of the same old ninja stars and nunchuks, I’ve uncovered 5 email marketing tips to add to your arsenal. According to Econsultancy, Engagement-RFM is a combination of behavioral data, and RFM (Recency, Frequency, Monetary value). Understanding how to craft the appropriate email touch points is key in communicating with your customers on an ongoing basis. The chart below details some of the different cycles within the customer lifetime that can provide guidance in creating email communication. A heads up that your team will be sending emails on an ongoing basis and ask if they would like to sign up. You may work with customers in a vast variety of industries, or a smaller group of defined markets. Either way it is essential that you know what makes different customers tick. Say you have a segment of customers within the healthcare industry. It would make sense to flavor your email content in a way that speaks to their unique set of pain points or needs. Alternately, retail customers should receive a different communication. If you’re sending a monthly newsletter with interesting stories and news, it’s okay to send it to all of your customers. However, it is very important that you also send some email communication that takes into consideration what different customers may have an interest in learning more about. Also, it shows that you’ve taken the time and have an interest in providing assistance in a customized way. If ninjas chose the middle of the day in an exposed area to strike, they would not be very successful. Similarly, knowing when and how to bring up particular opportunities with your customers is key. If you’re trying to upsell a customer with additional products or services, you should be aware of what else they may have going on that could affect purchasing decisions. Sending a direct email communication will always be more effective, but that doesn’t mean that you can’t send an email to all of your customers sharing case studies on success you’ve had with particular programs, or new services or products that you’re rolling out that they might find of interest. As a loyal customer, you’ve given them premier access to information noone else has. 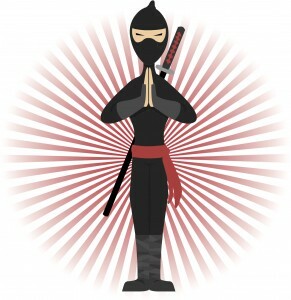 Whether you’re an email marketing ninja in training, or training ninjas of your own, connecting with your current customers is key in keeping them happy. A consistent flow of email communication as part of a larger integrated online marketing strategy will strengthen loyalty, retain business, and can even lead to your customers advocating on behalf of your brand. What type of email communication have you found works best with your customers and what feedback have they shared with you? Great insight. As more brands embrace email marketing this year (we’re thinking it will be the “content marketing of 2013”, they have to get smart about how they operate strategically and tactically. While good content and design are important, there will be lot of other factors that will determine if they will be successful. Thank you for reading. I couldn’t agree with you more. While good content and design are VERY important, those tactics alone do not equal email marketing success! It took me a really long time to understand how important a list is for my marketing efforts. This article had some very helpful insights. Thank you Katherine. I’m glad you enjoyed the article. Relationships, relationships, relationships! When we know how to use this well enough, and dedicate ourselves, this is THE thing that will bring back most reward. business finders,networking,social,business success,business success stories,social network marketing,success in business,social media marketing,social entrepreneurship,social deals,social media policy,networking companies,social media advertising,social coupons,networking tools,social media workshop. Writing good content is a pretty subjective arena, and entire libraries have been written on the topic. Give your subscribers a reason to read your emails and click things. And give the people what they want, and only the people who have asked for it. “Different Targets Require Alternate Weapons”… love this line! Knowing what makes your customer or prospect tick is often overlooked although this is critical. Great post and clever branding.